Karen Meece graduated March 2018 from our Massage Therapy program in Manhattan, Kansas. This is her story. I am living proof that each and every situation I have encountered has shaped me into the person I am today. Some situations I have orchestrated and planned, yet most have come out of the blue and been beyond my wildest dreams. One not-so-fun journey was a ten foot fall my husband sustained in Iraq in 2007. It became apparent his injuries were life changing, and about a year ago I had a lightbulb moment and thought I could maybe help him manage his pain level and improve his mobility. I wasn’t seeking a career. I am currently a busy, homeschool mom to our three children and a military spouse. Finding time to complete this course, I thought, would be impossible, but Bellus Academy’s night program fit my schedule. Before signing my name on the dotted line, I had many questions and was very specific in what my expectations were for the course. Even though my questions had been answered, I felt a lot was riding on my decision as my motivation to attend was solely to help my husband. To my relief, as I got to know my instructor the first week, she understood my goals and we discussed how we would fulfill those during my time at Bellus Academy. I can honestly say the Massage Therapy Program was what I was looking for and more. As a result, I gained a passion for Therapeutic Massage Therapy and met some wonderful friends along the way. The quality of my education at Bellus Academy superseded my expectations and the knowledge base of the instructors was outstanding. 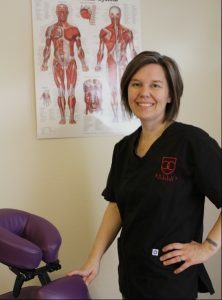 As journeys would have it, I have decided to pursue further education in Physical Therapy when my time as a homeschooling mother is complete. It is something I would never have thought of unless I would have taken this journey and something that massage therapy will marry well with. In addition to this, my goal was met and I am finally able to help my husband practically with massage therapy. I am glad to have gained a skill set I cannot only use for my family, but in the workplace when that opportunity presents itself. The instructors at Bellus Academy are committed to seeing you be your best and provide you with the tools you need. The day my simple internet search for “massage therapy schools nearby” happened, little did I know how much my journey in life would change and I am looking forward to where this will take me.